The Marine Mammal Center : Chicago-Bound - Two Young Sea Lion Pups Get a New Home at Brookfield Zoo! Chicago-Bound - Two Young Sea Lion Pups Get a New Home at Brookfield Zoo! Above: Volunteers from The Marine Mammal Center bottle-feed two orphaned sea lion pups. These two, days-old California sea lion pups made the cross-country trip from San Francisco to their new home at Brookfield Zoo in Chicago. In early June, the sea lions were rescued by volunteers from The Marine Mammal Center after members of the public spotted the pups in an unusual place sitting on floating docks at PIER 39. 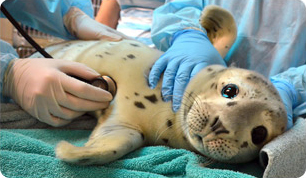 With no mother in site, and no chance of survival alone, rescuers brought the pinnipeds in for medical care. Because of the difficulties of raising sea lion pups of this age, the Center found a new home for them at Brookfield Zoo. Once stabilized at the Center, the pups were transported to Six Flags Discovery Kingdom in Vallejo until they were able to make the trip to Brookfield Zoo. During the month the pups were at Six Flags, Jennifer McGee, lead marine mammal trainer from Brookfield Zoo, took up residence in California to assist the Six Flags staff in the round-the-clock care the pups required. An abandoned sea lion pup rescued from PIER 39 awaits its dinner at The Marine Mammal Center. The sea lions are currently off exhibit and getting acclimated to their new surroundings and the zoo’s other sea lions and learning how to swim before they venture out into the bigger pools at the Pinniped Point exhibit. Zoo staff estimate it will be several more weeks before they will be able to have access to the outdoor pools. Now, they have a second chance at life, will be cared for, and serve as educational inspirations for the thousands of visitors to the zoo each year. Click here to read more about what researchers believe may be the cause of unusual birthplaces for sea lions this year!